Founded in 1930, the quarterly publication has a circulation of over 1,200. Its audience includes members of the Pennsylvania Chiefs of Police Association, which consists of Chiefs of Police and Commanding Officers of police forces, Staff Officers of the Pennsylvania State Police, heads of federal law enforcement agencies stationed in Pennsylvania, including the FBI, Secret Service, and US Post Office, and heads of security of businesses and corporations. Additional copies are distributed to various organizations and law enforcement practices or vend police equipment goods or services. A large number of libraries and government agencies receive the publication as well. The BULLETIN is published by the Pennsylvania Chiefs of Police Association. 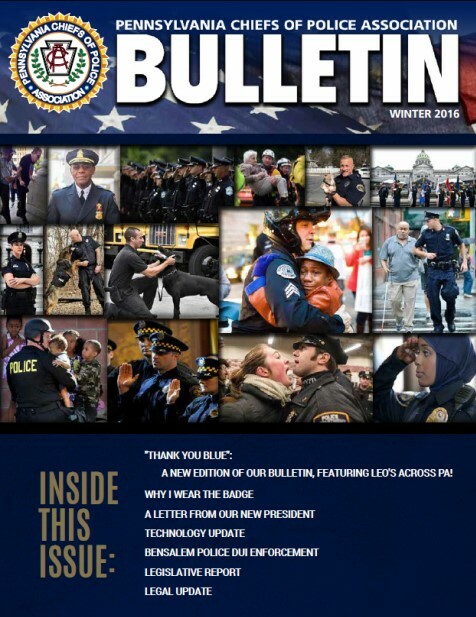 The content of the BULLETIN is to be a practical and useful reference medium that features law enforcement articles focusing on professional development, legislative issues and goals, new items, and goods and services of interest to the membership. Reviews and reports are submitted by members and other knowledgeable law enforcement personnel or experts. If you would like to submit an article for the magazine, please click here. Files can be submitted in the following formats: 300dpi TIF, PDF, or EPS. Ads can be black and white or color. Spot colors will be converted to CMYK (and may show some minor color shift.) No RGB color files, please. Full page ads should include at least 1/8” bleed on all sides.